CLEARFIELD SETTLEMENT, February 5, 1801. I am happy to see that your lordship has altered the resolution of removing me from here, which removal would be attended with the destruction of this new establishment. Catholics are gathering in from all quarters upon the promise that I made not to forsake them, in as far as I had it in my power to make such a promise. The plantation will hardly be able in two years to maintain a priest, unless there is yearly as much money spent in the improving of it as the congregation's salary amounts to. (Note by Miss Brownson; this means the salary which the congregation would be able to give. 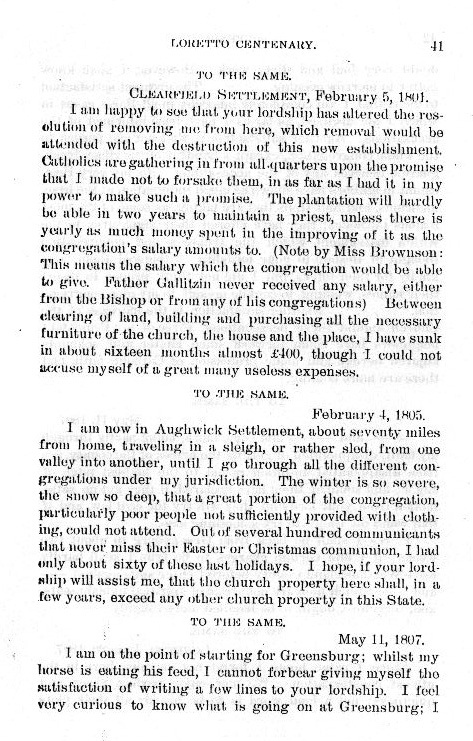 Father Gallitzin never received any salary, either from the Bishop or from any of his congregations) Between clearing of land, building and purchasing all the necessary furniture of the church, the house and the place, I have sunk in about sixteen months almost £400, though I could not accuse myself of a great many useless expenses. I am now in Aughwick Settlement, about seventy miles from home, traveling in a sleigh, or rather sled, from one valley into another, until I go through all the different congregations under my jurisdiction. The winter is so severe, the snow so deep, that a great portion of the congregation, particularly poor people not sufficiently provided with clothing, could not attend. Out of several hundred communicants that never miss their Easter or Christmas communion, I had only about sixty of these last holidays. I hope, if your lordship will assist me, that the church property here shall, in a few years, exceed any other church property in this State.